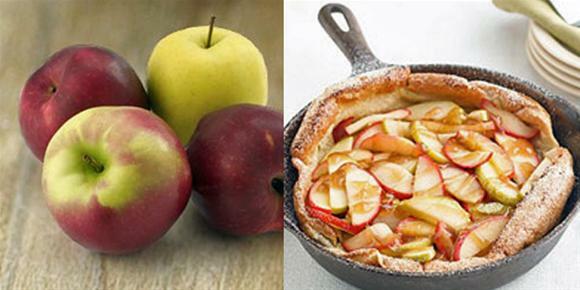 Apple pancakes are delicious and just right for dessert at a German Oktoberfest. In a large bowl, blend eggs, flour, baking powder, 10g of sugar and salt. Gradually stir in milk. Add vanilla, 30g of melted butter and half of the nutmeg. Let batter stand for 30 minutes or overnight. Put 55g of melted butter in a 25cm oven-proof skillet, brushing butter up on the sides of the pan. In a small bowl, combine 50 g of sugar, cinnamon and the rest of the nutmeg. Sprinkle the mixture over the butter. Line the pan with apple slices and sprinkle the remaining sugar over the apples. Place the pan over medium heat until the mixture bubbles, then gently pour the batter mixture over the apples. Set the oven for automatic mode, Oven dishes, Sweet dishes and bake. Preheat the oven to 220°C. Bake for 15 minutes. Reduce heat to 190°C and bake for another 10 minutes. Slide pancake onto serving platter and cut into wedges. What’s your favourite German dish? Create the ultimate Oktoberfest party, complete with menu suggestions, music and entertainment ideas, with Electrolux’s Dinner Explorer.